The living dead are getting good TV ratings at the moment, as the stonking audience for The Walking Dead continues to testify. Last weekend it was joined on UK TV by French series Les Revenants, aka The Returned, which pulled in an audience of 1.5 million, despite Channel Four milking breaking up every other scene with a bloody advert break. But before the series there was a feature film, also called Les Revenants and rather literally retitled They Came Back in the USA. The recently dead return to life and seem content merely to go back to their former lives, but their return causes a myriad of complications. Isham and Véronique have their trepidations, but they're generally happy, at first, to see their little boy Sylvain, and the town's elderly mayor welcomes home his wife, Martha. But Rachel, a government health official, cannot bring herself to visit her newly returned husband, Mathieu, at the ad-hoc shelter where the government houses the "zombies" like refugees. Eventually, she relents, and Mathieu returns home, but the living find that their loved ones are not exactly as they remember them. Studies soon reveal that the dead suffer from a form of aphasia. They cannot create new memories, and they cannot be trusted to perform any but the most menial tasks. Perhaps sensing the discomfort they cause the living, the dead gather together at night, and seem to be formulating some kind of secret plan. Directed and co-written in 2004 by Robin Campillo, whose next feature was the beguiling Vers le sud (Heading South) with Charlotte Rampling, the film stars Géraldine Pailhas (Don Juan DeMarco), Jonathan Zaccaï (The Beat That My Heart Skipped) and Frédéric Pierrot (Land and Freedom, and he also features in The ReturnedTV series). 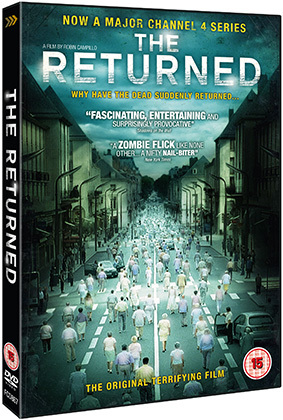 The Returned will be released on UK DVD on 22nd July 2013 by Arrow Films at the RRP of £12.99.